The extraordinary slipperiness of memory is something Doris Lessing notes with what seems like respect. She sees it as being up to lots of ‘little tricks … it simplifies, tidies up’. Aware of this, most writers try to shape their memories into a seamless whole, making of them a smooth story, crafted so cunningly that all the waywardness is trapped and tamed. 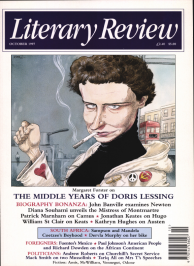 But Doris Lessing has no interest in the inherent deceit of this kind of ‘literary’ memoir. She prefers to slide and skate over the slipperiness, sometimes screeching to a halt, sometimes crashing into emotional undergrowth, but always trying to deliver each memory exactly how it came into her head, to be present again within it.